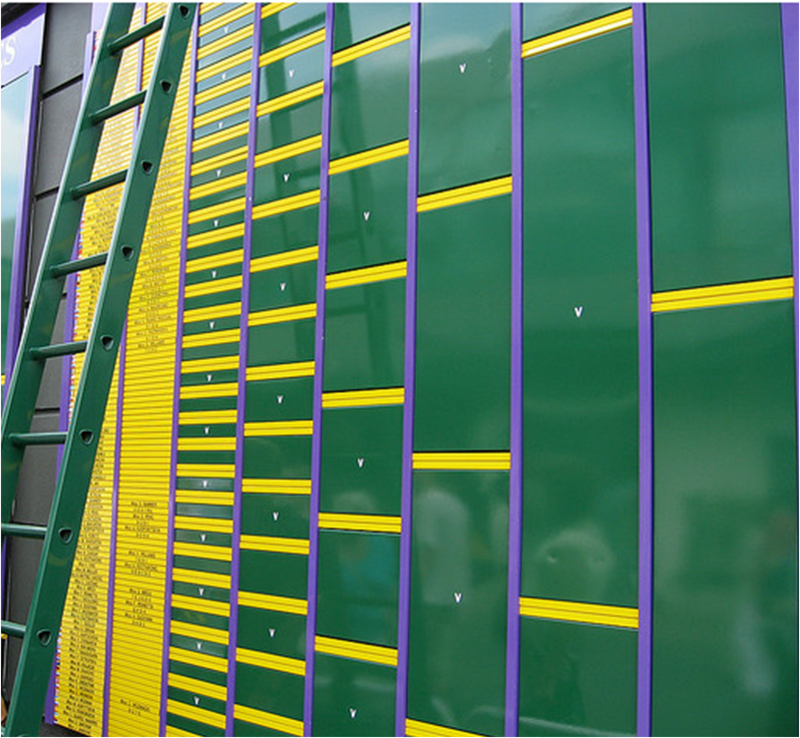 To translate for my brethren who are general sports fans, Monday is Wimbledon's Sweet 16 round. All of the remaining players in the draw will take the court (British weather permitting) for a shot at the quarterfinals. The 128 men who showed up a week ago with aspirations, however faint, of hoisting the Wimbledon trophy are down to 16 and there are only a few unexpected contenders among them. In short, expect some early 4th of July fireworks at the All England Club. Saving the toughest prediction for first, no? World No. 1 Nadal has reached the finals the last four times he's played at the All England Club and won Wimbledon twice. World No. 24 del Potro is in his first Round of 16 here. Epic mismatch? Not at all. del Potro was a top five player at the start of last year before his wrist gave out and sent him to the disabled list for almost a year. He's already won two titles in his comeback and has a big serve and flat, booming groundies that can hurt Nadal. Plus, the Argentine beat Nadal on the way to his first major championship, the 2009 US Open. That was a Nadal with as he put it, a "broke abdominal," and a del Potro on his favorite surface, hardcourt. On this court, at this point in their respective careers, advantage Nadal. Berdych was the losing 2010 finalist, falling to Nadal. The 29 year old Fish is the last American standing, playing his best Wimbledon to date. Fish defeated Marcel Granollers, Denis Istomin and a hobbled Robin Haase to reach the Round of 16, not exactly a murderer's row. Oh, he's apparently also given up steak frites according to ESPN. If they say it 807 times it must be true. Fish's sparse history at Wimbledon will not be enough to douse hopes for the reluctant top Yank, Berdych will have to do that. He hasn't dropped a set so far. There are few players in the draw who you want to discount more than Richard Gasquet. It's nothing personal, the Frenchman has a beautiful game and he seems to like himself a good party (we'll leave it at that), but he also seems to find a way to come up small in the big moments. He's a popular, former top 10 player on the upswing, but he's also only been past the 4th round of a major once. The good news is it was at Wimbledon. The bad news is, it was four years ago. Murray, the little brother of the Big Three atop the men's game, has been tested in this tournament, most recently going four sets against Ivan Ljubicic. That said, there's a difference between being tested and being beaten. Murray has passes his tests thus far, and he will on Monday. When was the last time we ever heard this much about Feliciano Lopez? Between Judy Murray nicknaming the Spaniard "Deliciano," and Justin Gimelstob insinuating that Lopez would agree with the moniker, Lopez is everywhere. When was the last time we heard anything about Lukasz Kubot? The 29 year old Pole is having a career week already. He's never won a singles title, barely ranked in the Top 100 and his best surface is clay. The fact is, tomorrow is a golden opportunity for both men. Quarterfinalist ranking points (360, more than you'd earn for say winning the title in LA in a couple weeks) and the $137,500 checks that go with them are at stake, so look for both men to come out fired up. Gimelstob may have backed off his comments slightly, but he thinks Feliciano likes the spotlight. His big serve and past results (2 quarterfinals) are evidence he likes Wimbledon, oh and he just dumped 8-seed Andy Roddick out of the Championships in one of the few big upsets of the fortnight. After Nadal/del Potro, which could go either way, this is certainly the most tantalizing match on the docket. The indefatigable Spaniard, Ferrer, has been stopped in the fourth round twice perviously at Wimbledon, while Tsonga's best was the quarters last year. Ferrer is among the best movers on tour. Tsonga can crack a winner from anywhere on court. They've only played once, on clay, so there's not much to glean from their history. Tsonga reached the final of the Queen's Club warm up event, Ferrer took time off. Ferrer's near his career high ranking; Tsonga has fallen to the edge of the Top 20. This match is a toss-up, should be fun (and long) to watch. The 18th seeded Russian has the unenviable draw of facing down Federer for a spot in the quarters. This is about Youzhny's ceiling, it's his sixth time in the Round of 16 at Wimbledon, but he's never gone further. He's gone only one round further at the Aussie and French Opens, though he has made it to the semis in New York. Youzhny is a talented player who's been as high as 8th in the world and has been in and out the top 20 since 2004. He's playing Roger Federer...at Wimbledon...in the 4th round. Federer is 10-0 against Youzhny. Someone beats Mikhail Youzhny 11 times in a row and his name is Roger Federer. Belgian veteran Xavier Malisse is on his way to the tennis retirement home at age 30, while 18 year old Aussie Bernard Tomic won't be able to have a beer (legally) when he comes to the States for the US Open series. Let me be honest, both of these guys are a bit lucky to be here. All credit to Tomic for not squandering the opportunity presented by 5th seed Robin Soderling's illness in their third round tussle. While Malisse played inspired tennis to oust 11 seed, Jurgen Melzer. Tomic told the press, "having gotten into the fourth round, I think I've got nothing to lose." Let me level with you, where the Aussie didn't, that's BS. This is the biggest match of Tomic's career and he's been on the Aussies' star watch way too long to even pretend not to know it. They've played once before on the grass at Queen's last year, Malisse won in three. This could go the distance again, but I think the pressure will get to Tomic this time. I could be lazy and just say Djokovic wins and I wouldn't exactly be failing to give you proper perspective. Djokovic will win this. He may have had a tough time with the similarly ranked Marcos Baghdatis, but Llodra is a different animal. He's not the big stage player that Baghdatis is. The 30 year-old veteran has never been past the fourth round of a (singles) major and has acquitted himself best on the doubles court. Djokovic isn't unbeatable at Wimbledon, but, no disrespect to Llodra, who is a wonderful player in his own right, a healthy Djokovic wins this match. Distinctive styles associated with Navigate Celebrity wrist watches instantly capture your own rado replica. Consider including the ER2A004D. This particular view includes a distinctive style for the reason that, rather than amounts through 1 in order to 12 tagging the actual face, this functions amounts through 0 in order to sixty about the external side from the face. Generally showcasing the begining proof sapphire gem rolex replica sale the public presence from the face, the trendy Navigate Celebrity wrist watches really are a well-liked option. The cost with regard to Navigate Celebrity wrist watches might be about the greater aspect, however the high quality as well as precision from the view because additionally it's life time assure a lot more than comprises for that large cost. Regardless of whether you desire to buy 1 on your own or even provide this aside like a present, fashionable as well as distinctive styles associated with Navigate Celebrity wrist watches are extremely attractive. hublot replica uk, the actual Navigate date view function big calls to be able to look at period very easily. The actual lustrous material put on the actual hr paintball guns and also the fingers is very effective therefore the luminescence endures nearly with the chanel replica bags. The actual big day time as well as day function offers additional attract the actual currently fashionable as well as distinctive style associated with Navigate Celebrity Wrist watches. Smooth s / s view situation was made not just to safeguard the actual internal cartier replica sale from the view however in order to additionally provide this an elegant appear.